I am still trying to wrap my own brain around this idea. I have been struggling with my own understanding of moderation for many years. Most prominently, in the past 14 months as I have been going through the various trials and tribulations of living life in sobriety. That type of life is not one of “moderation in everything”, it is moderation in some things and complete abstinence in others. Not the priesthood kind of abstinence, either. My girlfriend and I took a trip to the Houston Museum of Natural Science today. They have an exhibition on life in the Amazon. 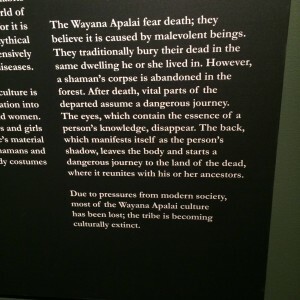 We walked through the recreation of a hut that typical Amazon tribal families lived in, looked at some shrunken heads, wondered about the mechanics of shrinking human heads, watched some videos of kids being bitten by ants to prove their manhood…this is starting to sound sort of dark…it seems that tribal life is pretty brutal. Duh. They had to live in nature the best way they knew how. We came up on a display case that had some various everyday type items that the tribal people used. Included in that display were a couple hand-rolled tobacco leaves. They looked like over-sized cigars. I jokingly made a comment about jumbo cigarettes. My girlfriend sort of chuckled, mostly because she is nice and likes me to feel like I can be funny sometimes. That’s how I perceive it anyway. Then we went through the rest of the exhibit and the museum. Later, as we were leaving the museum, we were sitting in a line of cars waiting to exit out of the parking garage. I noticed a guy smoking a cigarette near his car. I quit smoking in the past few months, so I go back and forth on being triggered when I see someone light up a cigarette. But, this time, it triggered an idea in me. I have always thought that people weren’t meant to smoke tobacco like we do. To me, it was meant to be ingested every now and then, in moderation, and mostly in a ceremonial capacity…not every 1-2 hours. After seeing those jumbo tribal cigarettes, I thought, maybe in the past, scarcity of resources made moderation a necessity, almost like an instinct. Now, with the amount of surplus we seemingly have, at least in this country, moderation has to be a learned habit. Moderation has to be a proactive trait we work at attaining simply because of our own abundance. It’s not a fully formed theory. But, it’s getting me to look deeper into the larger causes of some of the unbalanced behavior I observe in myself and society at large.